13 May 2017....... Halifax Town v Choley National Conference North Play-off Final at the MSI Shay stadium Halifax. 'Town manager Billy Heath. Picture Tony Johnson. Alfreton Town boss Billy Heath has paid a classy tribute to his outgoing striker Tom Denton. The big frontman has left the Reds to sign for National League side Chesterfield. It’s a move that takes Denton back into full-time football at the age of 29, so Heath didn’t want to stand in his way. “We’re extremely disappointed to let Tom go, we know what he brings to the table, know what he offers,” said the Alfreton manager. “It’s a loss for us but when an opportunity like this comes for a player, I’ve always stood by the fact that we have to let the player take it. Read what former bosses, team-mates and opponents have to say about Tom Denton. 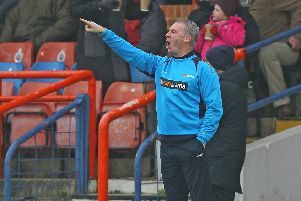 Heath has managed Denton at North Ferriby United, where they won the FA Trophy, and Halifax, where they won promotion to the National League, before they linked up again at Alfreton. He wished the striker well and acknowledged their successful working relationship. “Tom wanted to speak to them and the move back into the National League also attracted him, he’d be moving into a higher level and he was keen to do that. As for a replacement, Heath says he’s in no rush. “We won’t rush into anything; we have fantastic forwards at the football club all with bags of quality and we will take our time,” he said. Denton scored six goals in his first seven games for Alfreton this season.